St. Vincent’s Hospice have been overwhelmed by the support and generosity of the local community following the break in and robbery of one of their charity shops in Paisley earlier this week. The Hospice, which provides specialist palliative care for individuals with life limiting illnesses, reported that their Glenburn store had been broken into in the early hours of Monday 18 December. Along with the contents of the till and safe, the thieves caused extensive damage to the shop itself. In the days since the news came out, members of the local community have come out in force to support the charity, offering money, time and effort to help spread the word, raise awareness and get them back on their feet in time for Christmas. The Hospice has received hundreds of pounds in donations via anonymous drop-ins and their JustGiving page. 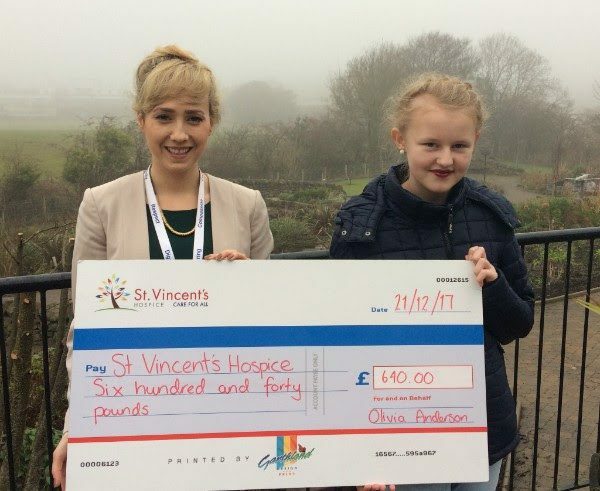 This included Olivia Anderson, who made the incredible donation of £640, on behalf of her family in memory of her Mum who was cared for in the Hospice. Along with offers of support from trade workers and organisations offering to carry out work to repair the damage to the shop. After learning that the door to the shop was damaged beyond repair, local joiner William Galloway contacted his suppliers at A1 Ironmongers and is now supplying and fitting a brand new door completely free of charge. Moya and Willie Paton also went above and beyond the call of duty, stopping by the store the day after the break-in to provide them with a new cash register, to let them get up and running. Kate added: “There are too many people to thank individually, but whether you have made a cash donation, shared out posts across social media or offered your time and effort to help fix the store, please know how humbled and grateful we are for all of your support. Our team work extremely hard 24 hours a day, seven days a week, and to see how much this means to so many is genuinely heart-warming, especially so close to Christmas.